Imagine being able to add a solo exhibition to your art business resume. Such an honor may seem out of reach, but this day and age you don’t have to wait around for an elusive gallery spot. There are so many other options that you should be considering. In fact, the possibilities for a solo exhibition are endless. Places like restaurants, coffee shops, art centers, banks, and airports are all great venues to display your work professionally, get new eyes on your art, and reach potential buyers. You just have to pick the right spot for you and your art business. 1. What is the space like? First, keep your eyes open for small yet significant details about the exhibition space. Consider a few more questions like how much foot traffic does the venue get? Does it have a good atmosphere for selling art? Are the location and hours of operation right for you and your customers? How organized, reliable, and friendly is the staff? 2. Is the client who comes here your target market? 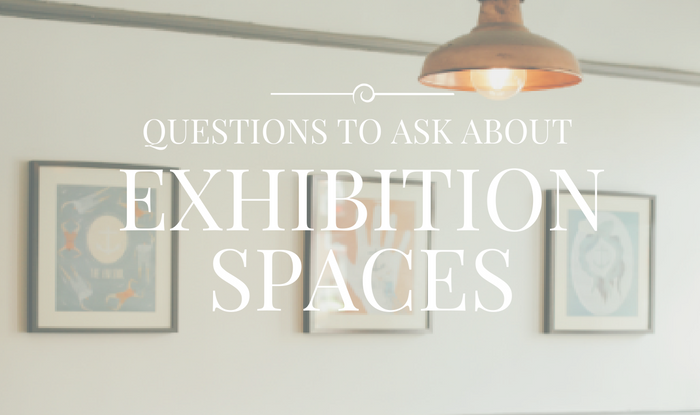 Asking this question before signing on to an exhibition space is critical. If the tastes of a typical customer in that venue do not match your style or price point, then you won’t be selling much art. 3. What expenses does the artist have to pay? Paying costs for rent, sales commissions, insurance, and damages may all fall on the shoulders of the artist. Save yourself the headache and determine ahead of time if that will that be your responsibility or the venue’s. TIP: Be sure to get a written contract firming up all of the answers to your questions. 4. What can the artist do? If you want to be proactive with your work, ask the space how much you can get involved. Can you hang your own artwork? Are you allowed to host private events or have prints nearby for sale? The more options you have to present your work, the more success you may find from your solo exhibition. 5. Who will handle the marketing? Does the venue have marketing materials ready to go? Is it a team effort to advertise, or is it all up to you to get the word out? Depending on what you are most comfortable doing, the answer may affect whether or not you want to go with that exhibition space. 6. What is the process for purchasing art? This is a big one, as you don’t want any hiccups when it comes to selling and getting paid. Nail down who will be handling and recording the transaction, while making sure that it’s easy as possible for the customer to make a purchase. Also, determine what will be the process for getting paid and how to handle delivery and pick up of pieces. 7. What is your goal & can this space help you reach it? Not every artist will have the same goal in mind for his or her solo exhibition—and that’s ok! Whether you are in it to sell more art, add fans to your network, or spread awareness about your art career, just make sure that your selected space will help you achieve that goal. Now you can pick the perfect exhibition space. Adding a solo exhibition to your resume is a huge honor, but it doesn’t come without a lot of hard work and organization. Make it easier to stay organized by keeping track of exhibition dates, the location of your pieces, and sales insights on Artwork Archive. Along with these questions, you’ll be ready for a successful solo exhibition. Ready to get organized for your exhibition? Sign up today for your free 30-day trial of Artwork Archive. As a professional artist, you’ve put your time, money, blood, sweat, and tears into your work. Is it protected?